Christmas decorations are going up in the village. Illuminated angels and snowflakes adorn power poles, garlands are draped across fences, electric candles glow in windows, and colored lights sparkle on eaves and porch posts. As the days and weeks pass there will be more holiday displays, although you'd hardly know December is peeking around the corner. I woke up this morning to a spring-like temperature in the high sixties. The sky is ashen gray, and a light breeze is rustling the trees, but it is warm. T-shirts are the order of the day it seems. Yesterday was considerably cooler, but even then bare feet tracks were in evidence at the beach. It's good to be alive! Our latest Newsletter is about the old Howard cemetery on British Cemetery Road. You can read the stories here. From Easter to Thanksgiving most islanders are immersed in "the season." Sure, we still enjoy family and friends, but businesses are full of people, streets are crowded with cars, trucks, bikes, and pedestrians, and the pace of life is quicker. Oh, we get to the beach (maybe not as often as we'd like), go clamming or fishing, enjoy local concerts, and love island life. But we all look forward to this time of year. Everything has slowed down. Right now there's not much business, of course. The streets are quiet, parking lots almost empty, and life is more relaxed. And its a time for reflection and relaxation and play. Al came by yesterday with a kite he'd made for his grandson, Max. I guess I inspired him! Maybe this afternoon we'll take the two youngsters out to the beach and fly kites together. It is certainly breezy enough today. Until then I'll continue organizing all of these piles of papers! Friday night a former island resident asked me about the old Howard cemetery on British Cemetery Road. She was hoping I would write a monthly newsletter about the cemetery. So I did. There are some interesting stories there -- the woman who lived to be 117 years old, the boy who died before he was born, a sea captain who went west with a wagon train, and a shipwrecked Arab sailor. You can read our article about the old Howard cemetery here. 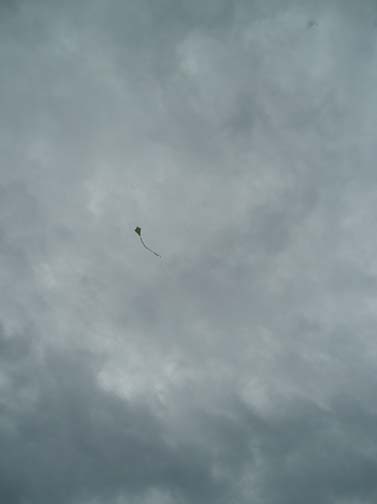 There was a stiff breeze yesterday so Lachlan, David, and I went out to the beach and launched our kite. I had to add a bit more to the tail to keep it steady, and then it soared. Sometimes it would loop and dive, depending on the air currents, but mostly it hovered far above us while we messed about on the beach. Our latest Newsletter is an article about Blackbeard the pirate and new research that suggests he may have been born in eastern North Carolina. You can read it here. I missed all of the fun yesterday. In the afternoon, from 1 to 4, Michael & Paula Schramel hosted an open house at their home on Lighthouse Road. The Schramels won the Ocracoke Preservation Society Old House Award this year for their work rehabilitating the 100 year old James Henry Garrish house. It is the one story building with the wrap around porch and metal roof about half way between the Island Inn and Albert Styron's store. All of the work was done to NC state preservation standards. Congratulation to Michael & Paula! At about the same time the Ocracoke Working Watermen's Association was offering seafood dinners at the fish house. I heard they were serving delicious seafood gumbo. Unfortunately I was working all afternoon and missed both the open house and the food. From 5 to 7 Mary Ellen and Jim Piland opened their home for a spontaneous early evening party. (One of the things I love about Ocracoke is the spontaneity of social gatherings. Neither the Schramels nor the Pilands had planned their get-togethers more than a day ahead, and everyone was invited. Word was just passed around the village informally.) I didn't get out of the Village Craftsmen until after 5:30, and was committed to baby sitting at 6:30 so I decided not to rush, and just went home to relax for a bit before Lachlan came over. Lachlan and I played and read until Mama and Daddy came home at about 8:30, so I can't say I missed all of the fun yesterday! Later today we'll be going out to the beach to fly our kite again. I'll take my camera this time. Last night the Ocrafolk Festival Fall Fund Raiser played to a full house. The Ocracoke Jazz Society opened the evening with two upbeat tunes. They were followed by one of Lou Ann's original Radio Theater skits. More music followed, to the enjoyment of all present. Marcie & Lou, Aaron Caswell, John Golden, and, of course, Molasses Creek, entertained with enthusiasm and high spirits. Jamie Tunnel, Jule Garrish, April Trueblood, and Sundae Horn added their engaging vocal talents to the evening. April's deadpan demeanor, and eccentric lyrics surprised most of the audience and tickled their funny bones. Next, Captain Rob captured everyone's attention with his original seafarer's version of "The Night Before Christmas." More talented performances followed. Donald Davis closed the show with a rousing story that kept everyone in stitches. On your next Thanksgiving visit to the island be sure to take in this delightful show. Like most Americans, many Ocracokers celebrate Thanksgiving with turkey and all of the fixings. The Howard family is no exception. About a dozen family members and friends gathered around my dining room table yesterday for good food and good conversation. We always repeat one of my grandfather's observations. Grandpop Guth was my mother's father, and he was born in Hungary. He came to the U.S. as a young man. Almost every time we sat down at the dinner table he would remark on the abundance of delicious and healthful food we enjoy in this country. "We eat good in America!" he would exclaim. Lachlan chimes in with the rest of us. "We eat good in America!" Today is no exception. My kitchen table was piled with leftovers at lunch today. We had turkey sandwiches, mashed potatoes, sweet potatoes, green beans, deviled eggs....and much more. And we'll enjoy more again this evening before we head over to the Community Center for the annual Fall fund raiser for the June, Ocrafolk Festival. If you're on the island we hope to see you there. Dallie, Jude, and I wish all of our readers a very happy Thanksgiving. We will be closed on Thursday so we can enjoy our turkey dinners with family and friends. My brother arrives on the island tonight, but I need to be gone much of tomorrow (I've got an appointment with my eye doctor in Elizabeth City). I'm sure he'll be able to entertain himself. Since I won't be on the island tomorrow, and we'll be closed on Thanksgiving Day, this will be the last post for a couple of days. Coincidentally, Thanksgiving Day this year is on November 22, the anniversary of the capture and killing of Blackbeard the pirate right here in Ocracoke waters in 1718. Don't eat too much turkey or dessert! It's been warming up again today. People have been out and about in light jackets, even shorts. Children are racing bicycles down the streets. Neighbors are walking their dogs. David has been scraping paint off of his window frames and priming them. I've seen Blanche picking up dead branches in the graveyards across the street. And tomorrow should be even warmer. The forecast for Thanksgiving is temperatures in the low 70s. Visitors are arriving for one last week on the island. Some are first timers. Others have been here many times. They all are looking forward to a delightful autumn week, and we who live here are as well. Lachlan and I made our kite yesterday (well, OK, I made the kite....Lachlan mostly ran around and got more and more excited). It is a paper diamond kite. Pretty standard, actually, at least for the kinds of kites I remember making as a kid. There were a few last minute details to attend to this morning. We tied on the bed sheet tail and attached the string to the "keel" (the extra string that goes from the top of the kite to the bottom), and then we were off to the beach. The wind was just about right, it seemed. But down on the flat beach we couldn't get the kite to stay up. The dunes were blocking the breeze. So we climbed to the top of the dunes and let 'er go. 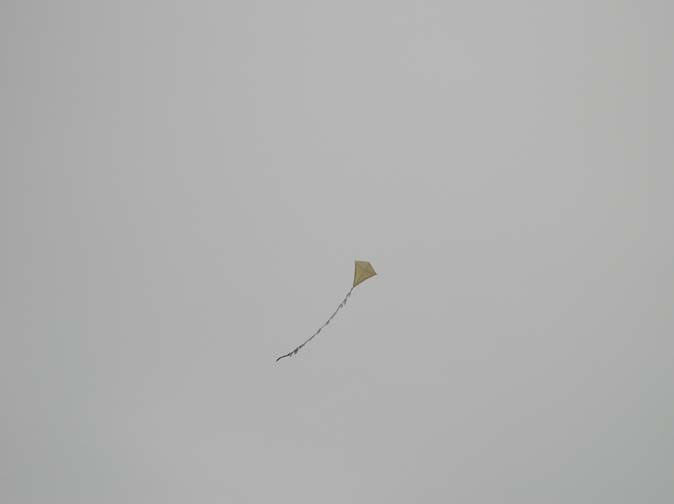 Out kite soared up into the sky. Every once in a while we'd have to move backwards or tighten up on the string to keep our beauty flying, but eventually it climbed high enough that we could tie our string down to the walk-over ramp and attend to other pressing matters like building sand castles and just running around. Every now and then we'd see the kite's shadow against the dunes. When we'd look up she was hovering gracefully like a benevolent spirit watching over us. The next time we go kite flying I'll take my camera and post a picture. The last two weeks of October were busy ones for me. I helped teach the "Ocracoke Sampler" for our OcraFolk School, and I participated in an NCCAT seminar on ghost tales. But I'm sure I've already mentioned these. During those same weeks a gentleman from South Carolina was on the island absorbing much about Ocracoke and our close-knit community. He was fortunate to learn about our special Opry performance (for the OcraFolk School, but open to the general public), and square dance. I met him briefly during intermission, and then again when he stopped by the Village Craftsmen before he left on his way home. Several days ago I was alerted to his personal blog site, "Balance, Celebration and Search" where he posted reflections on nine days of his vacation on Ocracoke. His name is Steve, and he is a pastor from South Carolina. He graciously agreed for me to provide a link to his site. In addition to some remarkable photographs (including a modern-day shipwreck that I had heard about but never got to see), Steve captures many of the sentiments visitors feel, especially their captivation with Ocracoke Island and its people. His verbal images and "turns of phrase" make for delightful reading....and his blog site is crisp, clean, and inviting. To read his posts just click on this link, Balance, and scroll to his posts for Oct 24 - Nov 1. I hope you enjoy them as much as I did. I recently received an email from a gentleman who had joined me for a Ghost & History Walk several weeks ago. The email contained a link to his web site (Canyon Rim Photography). He has posted 38 photos of his recent trip to Ocracoke. You can see his pictures by clicking here. The images are wonderful; his sunrises and sunsets are particularly stunning. Enjoy! Ocracoke has been basking in warm, almost summer-like weather practically all Fall. That changed overnight. Actually it changed yesterday. In the morning we had even turned the A/C on for about an hour. Until early-mid afternoon doors and windows were flung open. The temperature outside was in the mid-70s. As the afternoon progressed, however, a cold front moved through and the temperature dropped quickly. This morning the mercury had fallen into the low 40s, about a 35 degree difference. The air is crisp and clear. To be honest, this more normal November weather feels invigorating and refreshing. Lachlan wants me to make him a kite! I can't do it today, because I'm working, but I think it's a grand idea. Of course I could go down to Kitty Hawk Kites and buy him a plastic kite. It would be colorful and maybe even exotic. But how much more fun it would be to cut two sticks, tie them together with string to make a cross, and paste paper over them. We could cut up an old bed sheet (maybe a colorful one) and make a tail. Then we could head out to the beach and watch her fly! 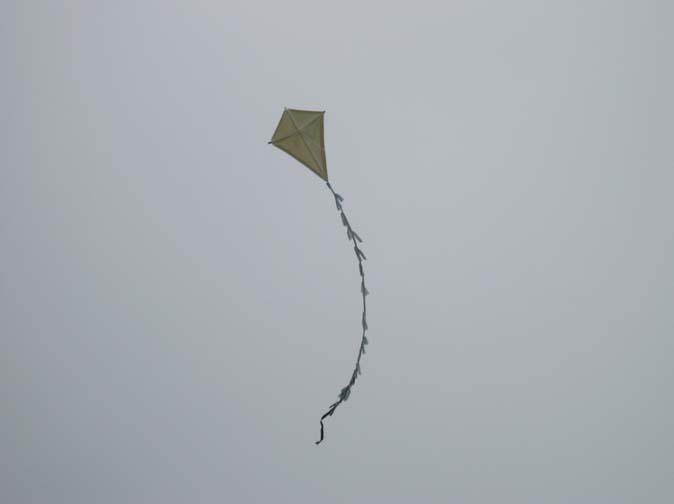 Today would have been a good day to fly a kite, at least in the morning. The wind was blowing about 25 mph (maybe it would have even been too windy!). But now it's raining and the temperature is dropping. I'll get the materials together, and maybe we can make our kite this weekend. If you see a paper diamond-shaped kite in the air out at the beach look for Lachlan and me. We might even let you fly it for a bit. I'm three days late, but just wanted to acknowledge that Sunday, November 11 was the 288th anniversary of the granting of Ocracoke Island by the Lords Proprietors to John Lovick, the first individual to hold ownership of the island. OK, so it's not something many people think about, but I believe that a sense of shared history is one thing that helps keep a community bound together. Another thing that maintains a close community is productive public meetings. Last night Hyde County officials met with a group of concerned citizens regarding how to pay for solid waste collection and removal on Ocracoke Island. At the present time much of the cost for this service is hidden in our tax bills. In addition there is much inequity in the additional fee structure. For instance the additional county fees for solid waste disposal make no distinction among businesses, whether they are small or large, or whether they generate much trash or hardly any. Citizens were encouraged to submit comments about the three options presented, and there were many thoughtful and intelligent questions raised. It was a well-conducted and productive meeting. We are all hoping that our county commissioners will endorse a fair and equitable system that puts minimum burden both on home owners and business owners. What a full weekend. Lou Ann arrived late afternoon on Friday. She was on the island to host a Murder Mystery interactive evening at the Cove B & B. Twenty guests from various states booked rooms just to be part of this weekend's fun. Lou Ann provided everyone with general information about the time and setting (it was 1823, a fierce storm was brewing, and the guests at the inn were brought together to solve a tragic murder that occurred during dinner). There was a ship captain (in frock coat, breeches, and a plumed hat! ), a local fisherman, a distraught widow, a laundress, a seamstress, the town gossip, a circuit riding preacher, a ship builder, and other characters. During a heated poker game mock tensions arose. Accusations flew, guests whispered back and forth, and the preacher was busy calming people's fears. Everything settled down long enough to enjoy a delicious catered dinner (from the Flying Melon restaurant), but then one of the guests died suddenly. Who done it? The rest of the evening was devoted to an inquiry. When the evening was over everyone agreed that it was totally fun, with many opportunities to play, exaggerate, act, and perform. We all voted for best actor, best actress, and best costume. Lou Ann awarded trophies. If your family or group is interested in hosting a Murder Mystery on Ocracoke, take a look at our Murder Mystery web page. Yes, I've been off the island (the reason for several days without a post), but only for today. Well, I was off island on Friday as well. I drove to Norfolk to pick up Lou Ann (that was Friday), and back to Norfolk again today (to carry her back to the airport). We had a fun and wonderful weekend. Lou Ann came to the island to orchestrate a Murder Mystery Weekend at the Cove Bed and Breakfast (I'll share more about that in another post). While she was here Tommy Hutcherson and Kathy Ballance O'Neal were married. Lou Ann and I stopped by their party on Friday night and went to the wedding (and reception) on Saturday. We also had an opportunity to be part of a pot luck dinner last night in honor of Julia Child. It's hard to imagine how we squeezed it all in -- in a matter of four days (and two of them involved ten hours, or more, of travel)! Let's just say we were creatively busy. And folks often wonder what we do here all winter.....and don't we "get bored" on this little island. Not on your life! I'll try to catch you up on things in the next few days. Right now I need to unload my car and give Lou Ann a call. I'll be back tomorrow. Last night Ocracoke Preservation Society held its annual meeting and pot luck dinner. Everyone agreed that the spread of delicious food was truly outstanding. Our guests from the NC state preservation office were especially impressed. After a brief meeting Ried Thomas and Claudia Deviney from the state office presented a Power Point program explaining the ways their organization has helped promote the preservation and rehabilitation of significant historical structures in eastern North Carolina. Every year since 1989 OPS awards a bronze plaque to be placed on a building in the historic district which has been maintained, restored, or rehabilitated to preserve the architectural features that allowed it to be included as a contributing structure when the historic district was established. This year the award was presented to Paula and Michael Schramel for their work in preserving the James Henry Garrish house on Lighthouse Road. They have done a beautiful job with this house, always abiding by the standards set forth by the state preservation office. Congratulations to Paula and Michael! Last night cool winds began to ripple through the village. After weeks of unseasonably warm days it was beginning to seem like Fall. I even put the heat on and settled down for the evening with my latest book. Today I'll continue concentrating on catching up -- organizing my office, answering emails, writing notes, ordering a new lap top, working on the Village Craftsmen web site. During the busy tourist season, it seems, everything falls to the wayside, and it takes weeks (months even) to "tie up all the loose ends." Several days ago I was asked, "Will you still be doing any walking tours [ghost and history tours] or is it getting to cold & slow???" Well, it's getting pretty cold and slow! We will be offering a tour on the Friday after Thanksgiving, but otherwise we'll be taking a break until next Spring. Interesting to hear about the Preservation Society interviews. What's the scope of the project (i.e., is it a focused, ongoing effort or something more casual, lots of people slated to be interviewed, etc.) and will the results be available for the public to view and enjoy? You often mention your friend Muzel. Might she be a subject of a future session? Very interested in the Preservation Society interviews...this sounds like a very important work, and one that's missing in so many other communities (and, even in families!). Would be wonderful to know how they plan to be used or published? The interviewing project is the idea of Clayton Gaskill (island videographer) and Ann Ehringhaus (island photographer). I interviewed Earl O'Neal and Blanche & Bertha, but Ann will be conducting some of the future interviews. They have compiled a list of folks they want to capture on tape/DVD, including Muzel. (By the way, island native, Kathy Ballance, and long-time island resident, Tommy Hutcherson, will be married this weekend. Muzel, who is 103 years old, will be Kathy's maid of honor!) I understand that the interviews will be archived at the Preservation Museum and will be available for research. I read your journal all the time I am also wiccan please everyone is not evil there is dark and white good and bad in all walks of life there are some misbelifs when its comes to us I hope that you take the time to read the following to gain a better understanding of Samhain and please also let it be known we do visit your peaceful island every year many of us we harm nobody we are really very peaceful people. Thank you for your comment. The full text of your comment can be found here. I am a strong defender of the first amendment, which reads in part, "Congress shall make no law respecting an establishment of religion, or prohibiting the free exercise thereof...."
Oh yes, egging -- how did this slip my mind??? Egging is a long-time island Halloween tradition. For years island teenagers have gathered in groups on Halloween night armed with cases of eggs which they toss about after dark. The mid 70s may have been the apogee of egg throwing here. Not only did the teenagers store eggs in the woods for weeks (maybe months), but they were indiscriminate about who or what they threw them at. Moving targets were especially tempting. By morning, road signs, commercial signs, cars, businesses, houses, boats, and virtually anything else might be plastered with eggs. In addition, skiffs, loose pilings, signs, and other large but movable objects would often end up across the roadways, in yards, or otherwise disturbed. Over the years parents, deputies, and teachers have been successful in toning down the mischief. Nowadays, it's mostly just egg throwing, and even that is usually confined to groups of kids battling it out amongst themselves. Businesses, neighbors, and automobiles are generally spared, and to my knowledge, the internecine youth rivalries are good-natured and short-lived. Hurricane Noel is already little more than a fleeting memory. This late offshore tropical storm blew by last Friday and Saturday with winds around 50 mph. It shut down the ferries for a while, and caused an electrical blackout for several hours, but otherwise had little impact on Ocracoke. Yesterday was bright and sunny. David and I carried Lachlan to Springer's Point where he waded in the Sound, explored the shoreline, and ran around looking for treasures. In the afternoon Ann Ehringhaus and I interviewed Blanche Howard Jolliff & Bertha Garrish O'Neal. Clayton Gaskill videoed the two hour session for the Ocracoke Preservation Society. Blanche and Bertha. dressed in their Sunday best, shared stories of hurricanes, childhood games, midwives, windmills, and island life in the early twentieth century. It was a delight to hear their stories. We've got several more interviews planned for future Sunday afternoons. The sun is shining again this morning, and the temperature will soon be in the upper 60s, I'm sure. Life is good. The following press release has been issued by the NCDOT. Please read this carefully if you are planning a visit to the island anytime between January 1, 2008 and mid-March, 2008. RALEIGH — The N.C. Department of Transportation will begin moving construction materials and equipment onto Ocracoke Island this month in preparation for the N.C. 12 bridge replacements scheduled to start in January 2008. All lanes will remain open from Friday, Dec. 21 through Wednesday, Jan. 2, to accommodate motorists traveling for the Christmas and New Year's Day holidays. Beginning on Wednesday, Jan. 2, through Friday, March 15, crews will close access to N.C. 12 on Ocracoke Island to replace seven bridges on the island. Work includes removing the current wooden bridges and replacing them with wider concrete structures. During this time, only four-wheel-drive vehicles will be able to use the established beach detour between the National Park Service campground and the Pony Pens to access the village of Ocracoke. All other vehicles must use the Swan Quarter and Cedar Island ferries to access Ocracoke. More traveler information as well as ferry schedule changes will be available next month. NCDOT reminds motorists to stay alert, travel at non-peak times and use alternate routes, when possible. Plan ahead before driving by visiting the NCDOT Traveler Information Management System Web site at www.ncdot.org/traffictravel/ or call 511, the state's toll-free travel information line for current travel conditions. For more information on this project, please contact Division 1 Maintenance Engineer Sterling Baker at (252) 482-7977. Recently I received several questions about Ocracoke and Portsmouth islands. Below, I post the questions along with my answers. "How is Halloween observed on the island? Is there some community event; do children trick or treat; is it encouraged or discouraged ? are there any traditions for this Day?Do residents decorate & carve pumpkins; how about some photos too??" Ocracoke School sponsors an annual Halloween Carnival with a children's costume parade, hot dog sale, games (dunking booth, dart throw, basketball toss, etc. ), Quizo (really, it's Bingo), and a Spook Walk down Howard Street. This year it rained a torrent. The Spook Walk was canceled, and rescheduled for the next Friday. The forecast called for high winds that Friday (Tropical Storm Noel), so the whole thing was finally canceled. It is typically one of the highlights of the carnival, with elaborate and realistic vignettes. Children go trick or treating on Halloween afternoon & evening, but seldom venture down Howard Street. Maybe it's TOO spooky! Some folks decorate with pumpkins, lights, "ghosts" in the trees, etc. Some don't. Ocracoke's current Assembly of God minister has expressed concerns about the celebration of Halloween. I do not share his views or his concerns. In November of 2005 I published in this journal a letter of his and my response. You can read both here. There are always adult parties at various restaurants and private homes. Costumes are often creative and lots of fun. "Philip,Your entry today sparked a few questions about daily life on Portsmouth Island in modern times. For example, are there not a few updated homes maintained/used by private, off-island owners? Aren't there some "permanent" (i.e., day-to-day) residents who live on the island? I thought National Park Service personnel who work around the village live there, but perhaps they too commute, like so many of us. And what about maintenance/services on the island? When I visited several years ago, we chatted a bit with maintenance personnel who were tooling about on ATVs. Do those folk work year round? Do you know if there's reliable cell phone coverage in/around the village. (I know, why would anyone WANT such an intrusion there, but my mind was just wandering in terms of a worst-case scenario...could day-trippers make an emergency call in dire circumstances?) And finally--for now--the island extends far southward, beyond the village; any insight into what lies beyond? Is it barren to the southern tip? As always, thanks in advance for your consideration." The village is on the national register of historic places and all structures in the village are "contributing." There are a very few homes on Portsmouth that are leased by private individuals. None are "updated" except that they may have composting toilets, or maybe an electric generator. The Park Service seems reluctant to grant any more leases, and may not renew those that expire in the next few years. There are no "permanent" residents of Portsmouth island. However, it is true that volunteers may live there for several months at a time. I don't know if anyone will be living there in the coming winter months. Dave Frum, the ranger there, lives on Ocracoke and commutes by boat every day. There are also construction workers there right now (they are repairing the Life Saving Station), but I believe they travel back and forth from the mainland every day. There are one or two ATVs that allow workers, volunteers, and rangers to move about the village and carry heavier loads (tree limbs, lumber, water, etc.). They make their work routines much more productive. Dave works on Portsmouth year around, unless the weather prevents him from getting there. Alltel phones work on Portsmouth. They also work on Ocracoke, although many other carriers' phones have no reception. There are remains of two other historic settlements on Portsmouth -- "Middle Community" and "Sheep's Head Island." Plans are underway to clear the "Straight Road" that leads to those areas, although little remains there. Farther south along the Core Banks (about 16miles distant) are a few rental cabins. But most of the sandy banks are uninhabited, part of the Cape Lookout National Seashore. You can camp on the beach, but must bring all of your food, water, and other equipment (especially insect repellent -- lots of it!). There are no facilities. There is a small private ferry that will carry four wheel drive vehicles to the banks from Atlantic, NC. Vehicles (other than Park Service ATVs) are not allowed in Portsmouth village. The grass landing strip has been closed for several years, so the only access to the island is by boat. Several days ago we published our latest Ocracoke Newsletter, comments on the history of Ocracoke's most (in)famous visitor, Captain Edward Teach, aka Black Beard the Pirate. There has been some fascinating new research exploring Black Beard's origins. You can read some of the latest information by clicking here. I woke up this morning to wind....25 - 30 mph wind....from Hurricane Noel which is tracking to the northeast offshore. Forecasters are calling for high surf with breakers of 8 - 10 feet later today. I think I'll check out the beach sometime this afternoon. It is always exciting to see the ocean worked up. It is a periodic reminder of how vulnerable we are in the face of wild nature. Yesterday I accompanied twenty-one teachers to Portsmouth, the abandoned village on the south side of Ocracoke inlet. It was the perfect day -- just cool enough for a light jacket in the morning; t-shirt weather by mid afternoon. And hardly a mosquito to be felt! Almost unheard of. We walked unmolested to the Salter home, the post office, the school, the Dixon home, the church, and the US Life Saving Station. One of the teachers played a hymn on the church piano, we walked up into the tower at the station to survey the village and the sound, and we marveled at the high tide lines on the wooden marker outside the post office. At times it seemed as if we might be standing among the citizens, the children, the life savers, and the fishermen of this small, isolated village that two hundred years ago was bustling with commerce and the daily activities of a thriving seaport town. But today Portsmouth is one of this country's last refuges for peace and quiet. The houses are vacant now; the church bell is silent; the Life Saving Station is empty; and the sandy lanes are quiet. It is the perfect retreat from the busy-ness of the modern world. Our latest monthly newsletter is Lou Ann's story of commercial clamming with 13 year old Morty. You can read it here.